Budget managers and staff are invited to participate in upcoming training sessions for Paperless Accounts Payable, P-Cards, and Purchasing. There are three sessions currently scheduled. Augsburg College men's and women's cross country/track and field head coach Dennis Barker is featured in an online documentary film about the training of four runners for this Saturday's U.S. Olympic Marathon Trials in Houston, Texas. 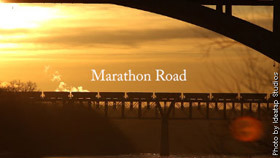 The film, titled "Marathon Road," was produced by a group that includes four Augsburg cross country/track and field alumni: Paul Sanft '05, Dan Vogel '05, Riley Conway '05 and Tori Bahr '09 -- through Sanft's company, Ideatap Studios. The documentary profiles Barker's work with his four male Team USA Minnesota runners: jason Lehmkule, Andrew Carlson, Matt Gabrielson and Josh Moen. In addition to the four men, two of Barker's female Team USA Minnesota runners are also competing in the Olympic trials: Katie McGregor and current Augsburg track and field assistant coach Meghan Armstrong Peyton. "As student-athletes, Riley, Paul, Tori and I saw these guys and many other Team USA Minnesota runners working out throughout the school year—at very fast paces—and were always inspired by what they could do. They were a huge source of motivation for us as Auggie athletes," Vogel said. "So we decided to give back to them by documenting their training and provide motivation and inspiration to people all over the city, state, and country leading up to Saturday's big race." Read the full article and watch the documentary on the Augsburg Athletics site.